Is there a better alternative to Discs2Go? Is Discs2Go really the best app in File Management category? Will Discs2Go work good on macOS 10.13.4? 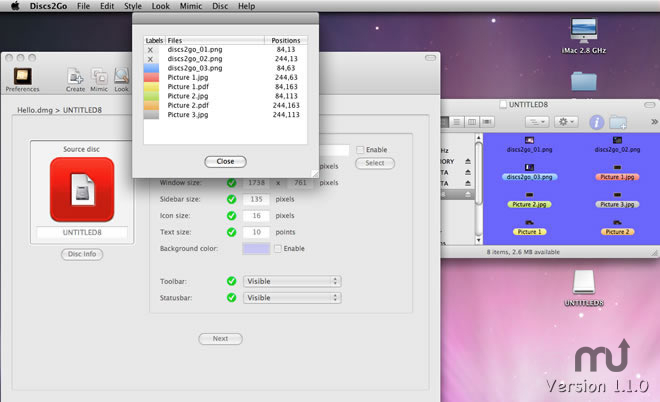 Discs2Go is a software title that specializes in Mac disc images. (Disc) Mimic, one of its component, allows the user to copy the style of a source disc volume and simulate on a Read/Write target disc volume. Or use Look to add/delete visible or invisible files on a disc volume quicly and easily. Discs2Go needs a review. Be the first to review this app and get the discussion started! Discs2Go needs a rating. Be the first to rate this app and get the discussion started!